So often we read about bad eBay sellers. They are selling counterfeit autographs or fake patches and every so often we come across the sellers who just don’t come through with shipping and you never get your item. This was the situation that I was in a couple of weeks ago when I picked up a Frank Mir Cage relic. After I won the auction I paid and waited patiently as time passed, the item was marked as shipped but after 10 days nothing came. I figured that it was a lost cause but the seller emailed me explaining the delay and because of this he was going to give me something extra. 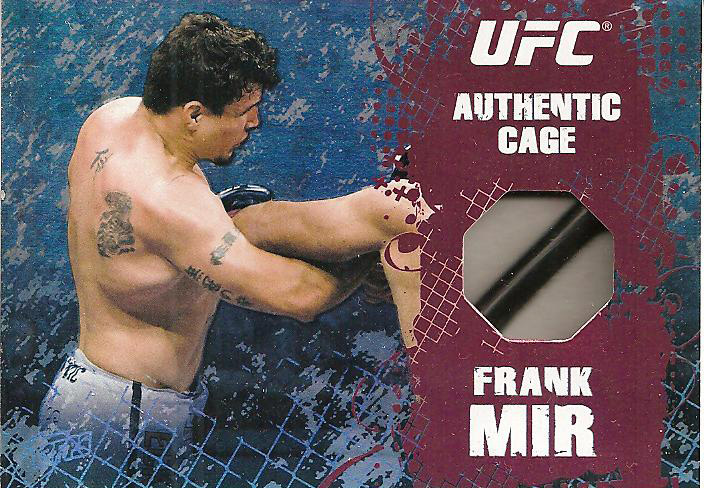 While not my favorite fighter overall Frank Mir is in my Top 5 or 6 fighters. He is a black belt in Kenpo which is my draw; I train in American Kenpo so I support a brother here. He also handed Brock Lesnar his first UFC loss back in 2008 (though Mir lost in the 2009 rematch). Mir is only 31 and probably has a couple of years left in his career but has gone 2-2 over the last 2 years and will be facing Roy Nelson in a couple of weeks at UFC 130. This afternoon I took my kids to dance class so my wife decided to take some personal time and get her nails done. I am sitting in the dance studio reading my book and my phone starts getting blasted with text messages from my wife at the nail salon. Of course being a Baltimore Ravens fan and living in the East Valley I know she is talking about Terrell Suggs, who graduated from Hamilton High School here in Chandler. There are actually 2 Baltimore players from the East Valley, Suggs and Todd Heap (who graduated from my old high school in Mesa). Panini just released information about their upcoming 2011 Panini All Goalies release set to hit shelves on June 8th with a $19.99 price tag. For $20 you get 100 cards, 5 parallels and a memorabilia card. The set will include only goalies and Panini states that every goalie that has dressed for a game this season will be included along with legends like Patrick Roy, Felix Potvin and CuJo. 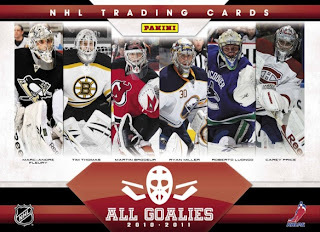 This product may not be in line with ITG’s Between The Pipes set but Panini is putting a very reasonable priced set in to the hands of the collectors plus you get a memorabilia card. 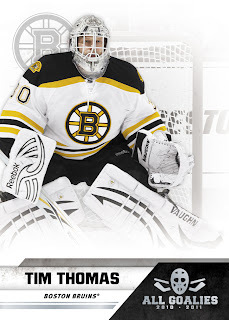 The base cards are nothing special, along the lines of Fleer basketball from the 1990s but the memorabilia cards, if the Stopper Sweaters preview picture is what we can expect, are pretty sweet looking. With the NFL Draft this week we have already seen Leaf beat everyone else to the draw with 2011 Leaf Metal Draft football, an unlicensed product. Over the next month we see a slew of NFL releases hitting the shelf and everyone will most likely be grabbing up the licensed products. One of the next products to drop will be Panini’s 2011 Prestige Football hitting May 18, 2011. 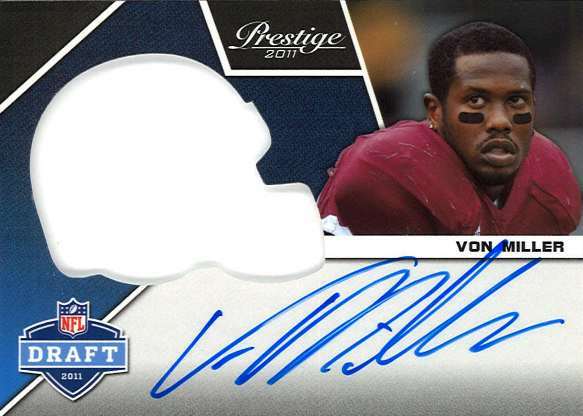 Panini has posted up some preview images of some of the hard-signed autograph hits including Ryan Mallett, Jake Locker and Von Miller. Because of the time frame of the release these cards do not include team names or logos but there will be relic cards included with the autographs. You may notice that Panini seems to be experiencing a bit of an identity crisis, the designs range from decent to down-right awful. You will notice with the Mallett cards, the first one will be a relic (contained within the helmet die-cut) autograph card. This is actually a decent design; there is a nice image of the player along with a similar sized relic and a nice placement of the hard-signed autograph. The design is pleasing in color and style; nothing seems out of place, no floating relics or sticker autograph. This is a nice card. 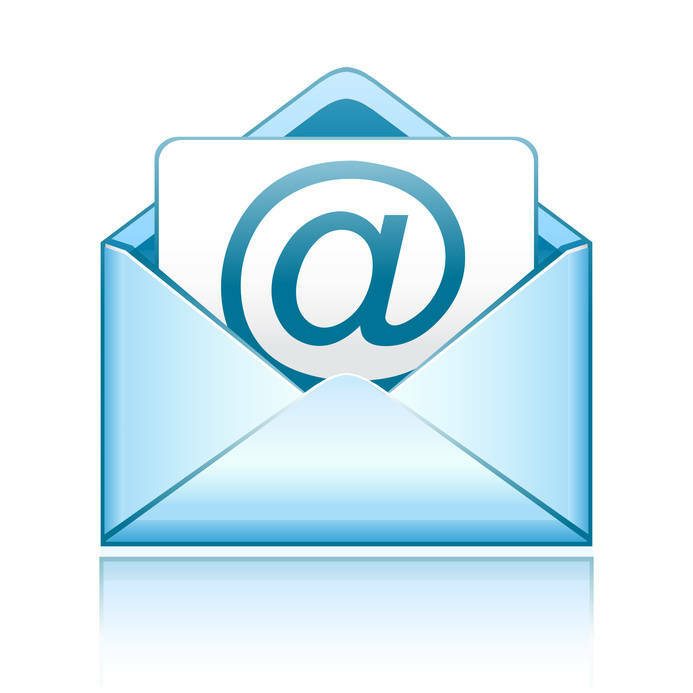 But with the next examples you begin to question the logic in the design phase. In the second autograph card the player image has been shrunk down to dime size and moved to the upper left corner to be balanced out by the Prestige logo on the opposite corner. 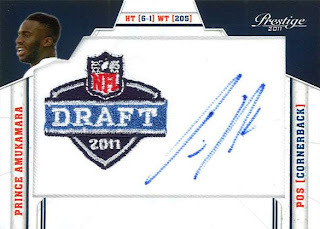 The NFL Draft logo now takes precedent over everything including the player’s autograph, which you will notice was actually forced off of the bottom of the card. 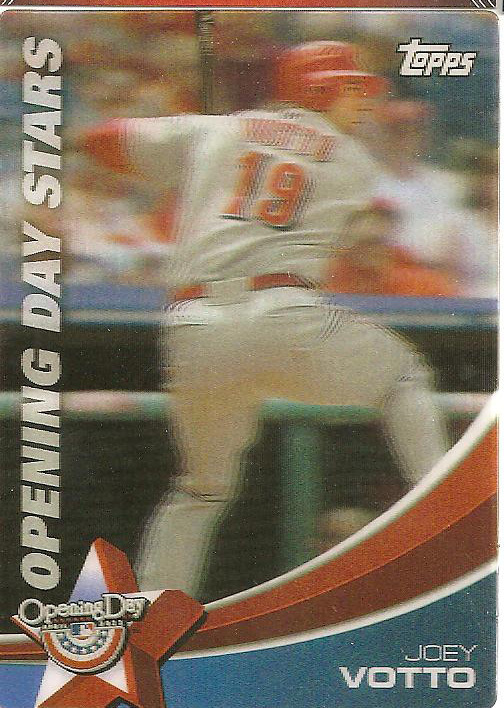 The player’s name, position and height/weight have awkwardly been placed around the card in a non-discerning manor. 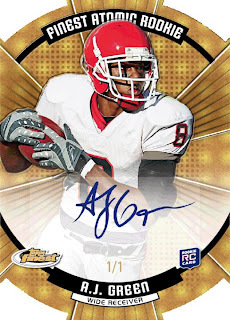 If Panini wanted to shrink the player’s image the only reason should have been to highlight the player’s autograph in the center of the card and the image should have properly been balanced. As you can see that is not what happened. 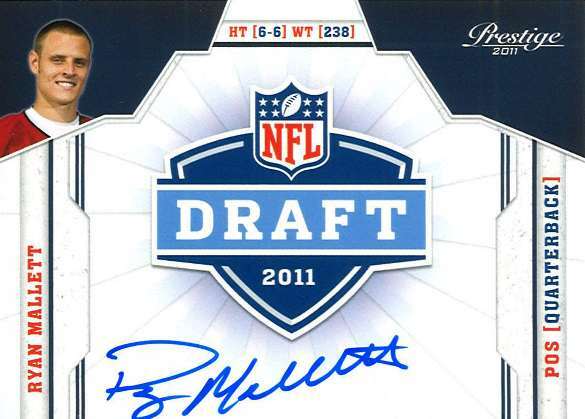 The next example replaces the NFL Draft logo with a manufactured patch with the card remaining the same otherwise. 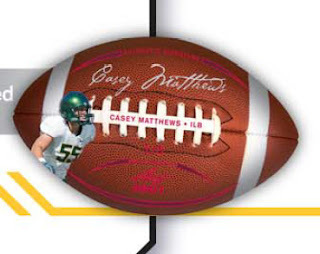 At least centering the player’s autograph was a nice change over the NFL Draft logo so this would be a step up but honestly the manufactured logo should have been left out completely. Maybe if Panini had used a player’s college jersey for the jumbo swatch (or at least used the color of the player’s college jerseys) and had the player autograph that it would have worked out better. Even worse are the versions where Panini used the NFL Draft logo as the manufactured logo like on Prince Amukamara’s card. 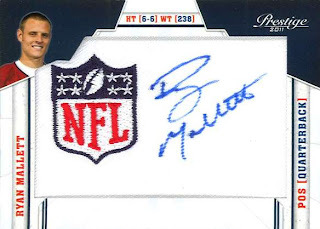 The manufactured patch autograph cards leave a large negative space along the bottom border of the card, just enough to draw someones eyes away from the autograph, which is a graphic designer "no-no". 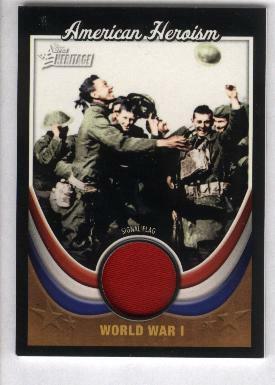 To correct this injustice Panini should have dropped the player's name, position and height/weight from around the manu-patch and instead placed the player's name along the bottom border of the card which would balance the card with the autograph and logo/patch. In my 2011 Topps Opening Day blaster I feel that I am experiencing deja-vu. 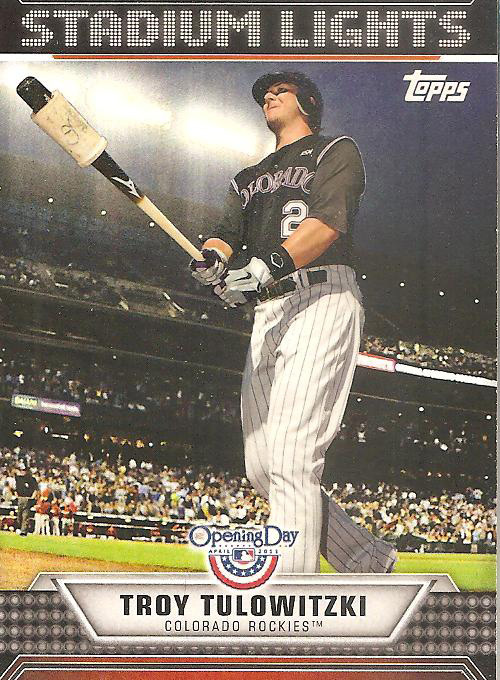 The base set is the same 2011 Topps Series 1 design with the addition of the Opening Day logo. Now I like the design but I guess I don’t fully comprehend the Opening Day release. Why release the same set twice unless the intent is to get collectors to buy in for the opportunity to get cards specific to that release. 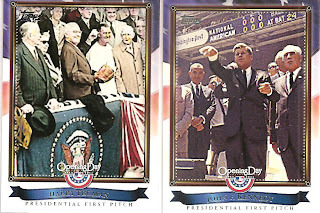 Like I said, the set is nicely designed and fortunately they only added in two parallels, the Blue parallel #/2011 and Printing Plates. Cards of note that I pulled include a Felix Hernandez base and 3 Blue parallels (Rickey Romero, Brian Wilson and Tyler Colvin). I pulled 3 Superstar Celebrations, which seem like they would have been a better fit in the Series 1 release because they are not tied to Opening Day. 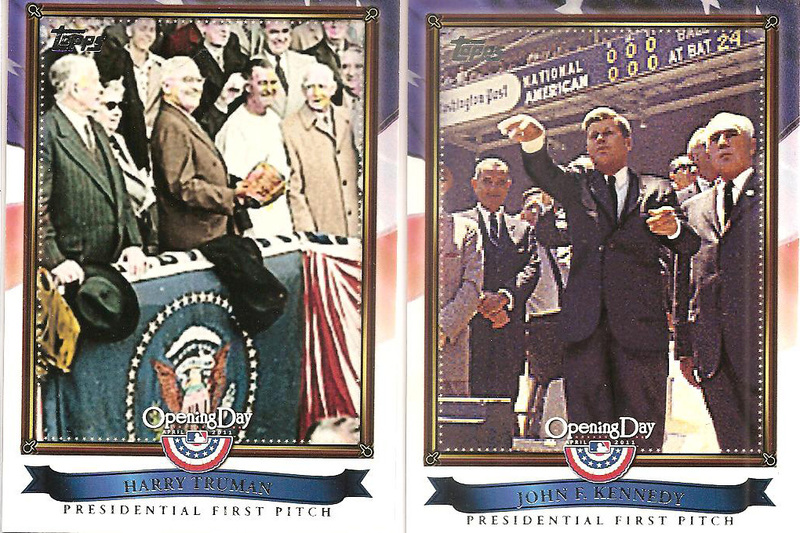 The Presidential First Pitch cards are a nice addition chronicling famous first pitches, but why limit it to a 10-card subset? 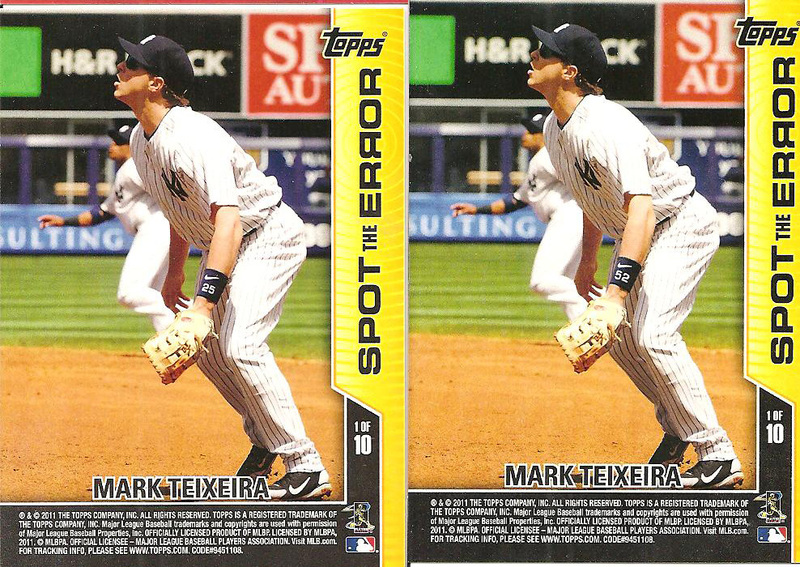 I am not a fan of Topps gimmick cards, they may be “fun” so I can see the idea behind their inclusion and some collectors probably like the Mascots subset, I know I would grab up a Mariner Moose if I came across one, but the Spot The Error cards make me just go “Huh?” I got the Teixeria error (His jersey #25 is reversed on his wrist band) but I cannot figure out the error on David Wright’s card. The best cards of the blaster were the Votto Opening Day Stars, I really like the 3D cards, and the series covers the players Opening Day stats. Unfortunately it is only a 10 card subset and no Mariners or D-backs on the list. The other card, one that I was really looking forward to, is the Stadium Lights card. As much as I like 3D cards I am crazy about glow-in-the-dark card. Again a 10 card subset but oddly contains 2 Mariners (Ichiro and King Felix), I pulled the Troy Tulowitzki card. Last month I bought a blaster of 2011 Topps Opening Day and I am finally going through the packs. But as I go through the packs I realize that last year was an end of an era for me when Griffey finally retired leaving me in a position where I do not have any one specific player to collect. 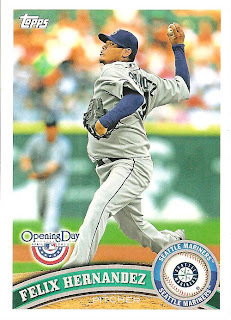 I am a life-long Mariners fan but I just never jumped on the band wagon with collecting Ichiro or King Felix. Dustin Ackley is a young player I like but because he is struggling in the minors he does not have many cards showing up on any checklist. I am a Diamondbacks fan too and there are a number of young talented players coming through the desert that I like including Justin Upton and Stephen Drew so I may just turn my collection to the home team but remain a Seattle fan at heart. Sadly I find myself in similar situations in the NBA (Suns fan) and NFL (Seahawks fan). It seems like the teams I collect are getting old and they do not really have any rising stars. The Suns do have Channing Frye (Yeah U of A) and the Seahawks have Golden Tate plus Mike Williams proved he has some serious playing left in him so I guess there are a couple of options. It is difficult to let go of my old players and move on to the young guns. 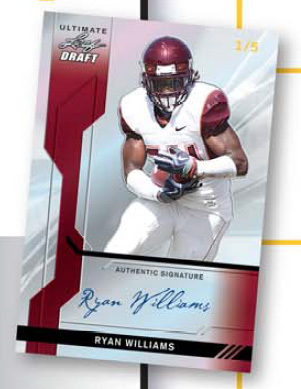 In an interesting release from Leaf we will see 4 cards per pack/box and each card will be autographed. Each box will also contain 1 of each card from the set; 1 Base Auto, 1 Metal Auto, 1 Football Die-cut Auto and 1 Helmet Die-Cut. This is also an offensive heavy release. Oh yea, every card is ON-CARD SIGNED. If Leaf broke down the collation so that each player signed the same amount of autographs for each insert then we should see not more than 257 total autographs per player with each player signing 64 autographs in each of the 4 inserts. But it appears that Leaf did not break down every player evenly because they state that every card is numbered to /#49 with some having parallels of /#20, /#5 and 1/1 meaning that some players will have up to 75 autographs in certain inserts. I would expect to see players like Newton, Green, Gabbert, Mallett, Locker, Ingram and possibly Julio Jones as the players with more autos. I do not know how I feel about this product. I liked the Metal Draft release, it kind of reminds me of the old Pacific releases from the 90s but with this one I am torn. 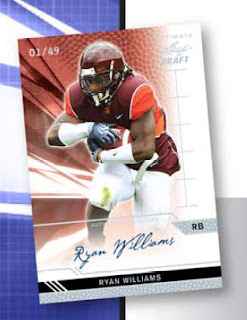 Topps has stated that all of the rookies will be pictured in NFL uniforms, which is a big plus. Even though we may not get to see these rookies play in their pro uniforms at least the cards will show them in their proper uniform. 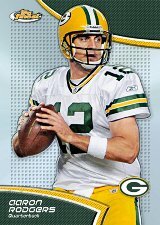 The set consists of 125 total cards, 90 veterans and 35 rookies, and each card has 8 parallels. 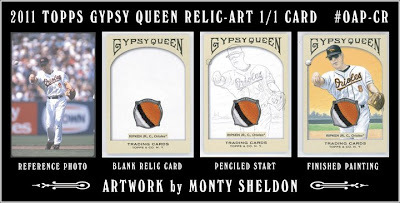 Once again Topps thinks more is the way to go and this seems to be a continuing trend (They had 13 parallels for each base card in the 2011 Topps Baseball release). Straight up this release is a hot mess. 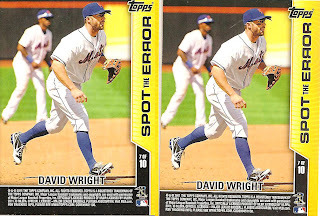 Topps created a boring design that really is not appealing in any way graphically. Most autographs are stickers, a couple are on-card, and some of the inserts actually have borders around the stickers highlighting this travesty even more. 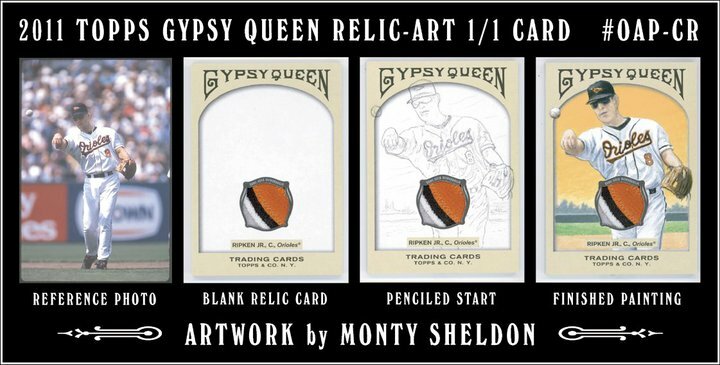 Add in plain dime-sized jersey swatches, which are also bordered to highlight the relic, and collectors are left scratching their heads. 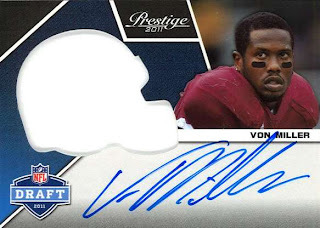 Oddly some of the cards have the sticker autographs placed over a fog beneath the player which at least allows the autograph to stand out against the background but other sticker autographs are placed solidly over the player causing the autograph to “vanish” in to the busy background. Even the "Jumbo" relics are barely larger than a dime in size, hardly what most people would consider jumbo. This is clearly one of those sets that looks like it was thrown together just to add something to the release calender. You wonder if Topps designers just gave up on this one. It makes me wonder if Finest has hit its pinnacle and it is all downhill from now on. My son has “the shine” or at least something lucky about him right now. In the past week he has grabbed a rack pack of 2010 Topps WWE Platinum, 3 packs of 2010 Panini Gridiron Gear football and a pack of 2010-11 Panini Threads basketball and in those 7 packs (the rack pack consisted of 3 individual packs of Topps WWE Platinum) he has pulled 3 relics. Not bad pulls either. 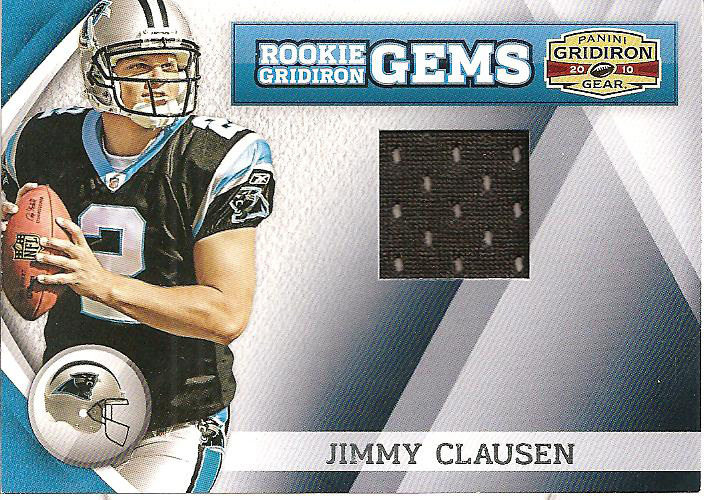 A Rookie Gridiron Gems Jimmy Clausen jersey #/50, JJ Barea jersey #/399 and a Platinum Green Big Show Shirt relic #/399. Can someone please explain to me why the Gridiron Rookie Gem Jumbo Autograph Relics are #/223 and the Jumbo Relics is #/25 but the dime sized jersey relics are #/50? 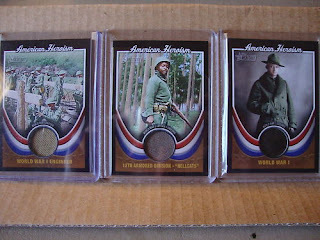 Logically wouldn’t you think the jersey relics would be #/223, Jumbo relics to #/50 and the Jumbo Autograph versions #/25? 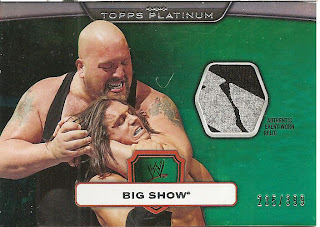 The Big Show relic is very cool because it contains a part of the screen printing on the shirt so it isn’t just a plain black shirt swatch. I have only seen one other Green version with the screen printing so I guess we were very luck with this pull. Most of the Blue (#/99) and Gold (#/25) autograph versions seem to have screen printing on them. For a hockey collector this time of year is the most exciting time. The season is now done and the NHL Playoffs begin tomorrow, the draft order was just selected (Edmonton will be picking first at the NHL Draft in June) and 6 products will be hitting the shelves in the next two weeks with a 7th, Panini Zenith dropping on May 11, 2011. ITG’s Between The Pipes goalie orientated set is one of the most anticipated sets each year. ITG may not have an NHL license but they release a beautiful product every year. Goalies have a mystical aura about them plus with all the equipment they wear you can expect to see some amazing patches including gloves, sticks, emblems and numbers plus straps. This set highlights game-used memorabilia, autographs, non-memorabilia and goalie cards with each hitting at 1:8 packs so you should see 2 of each insert in each box. In The Game puts out an amazing set every year and this year is no different. The goalies are the “peacocks” on the rink with most goalies creating some amazing mask designs; add in the glove, large sticks and pads and you have the opportunity for some amazing patch cards. The memorabilia cards include sticks, jersey relics, number patches, emblem patches, glove patches, country related patches and a very cool “Complete Jersey” quad patch that includes jersey, fight strap, number and emblem patches. The Showdown dual patches highlight two goalies who competed against each other in situations like the Stanley Cup. 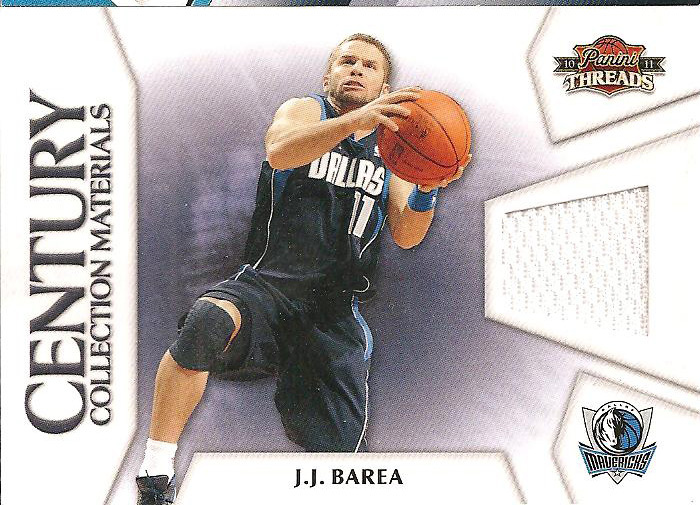 A nice addition to this release is the focus on Montreal and Toronto net-minders with the Guarding inserts. 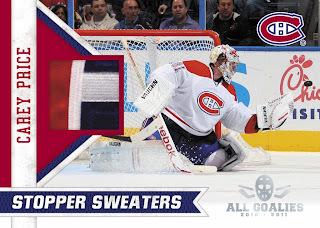 There is the Guarding the Bleu, Blanc et Rouge Net (Montreal) and Guarding the Blue and White Net (Toronto) inserts. There are 10 goalies on each checklist from the respective teams. The Inspired Masks and 100 Year cards are also very nice additions to the insert checklist. 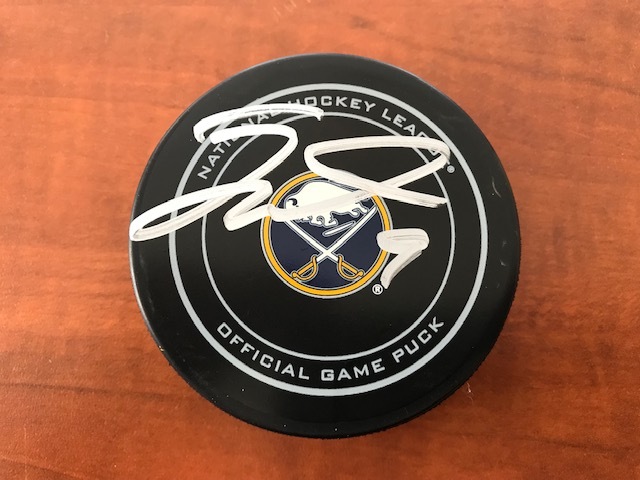 I believe that the cards are all on-card autographs (if anyone can verify that I would appreciate the information) and this includes 130 individual goalies through-out a 6 set checklist including Future Stars, Stars of the Game, Immortals, Women of the Nets and One Game Wonders (interesting idea). This is a solid 4 out of 5 set. I like the way that ITG produces year after year, the only downside obviously is because ITG does not have an NHL license. I would like to see the NHL rectify that in the near future because while they produce an un-licensed product they do the sport justice. I picked up a WWI Signal Flag relic after posting about the other WWI relics the other day. I was hoping to get a red version but the only one I have seen is selling for $19.99 BIN plus shipping and this one was significantly cheaper. The nice thing about this relic is the stitching that runs at an angle right through the middle of the swatch. The back lists this as a "authentic piece of signal flag used in World War I". 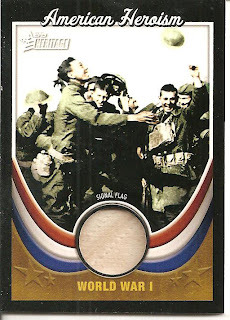 To add to my want list is a variation of the Signal Flag relic, there is a SP prime patch thick version that contains a piece of the bag (or "kit") that was used to carry the signal flags during battle. I came across two so far, missing out on one that finally sold around $5.00 plus shipping and the only other one is at $49.88 BIN which is more then I am willing to spend. 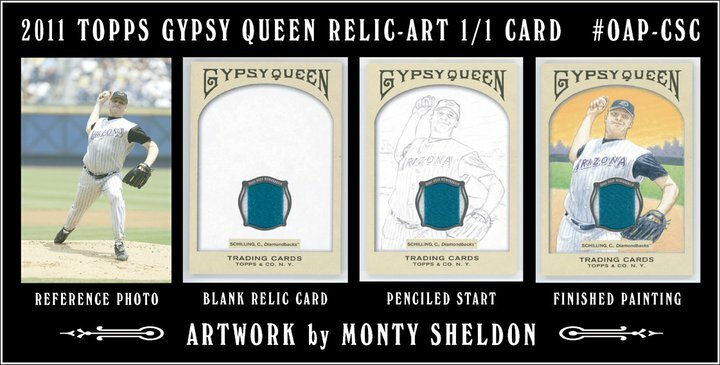 Yesterday I posted a story about the new Topps Gypsy Queen sketch relic cards. 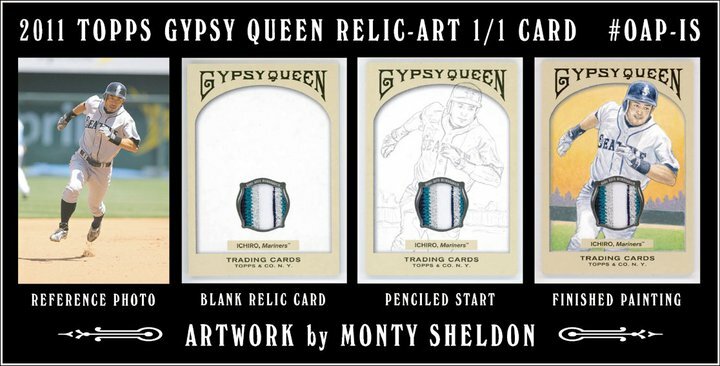 Each card is hand painted by artist Monty Sheldon. 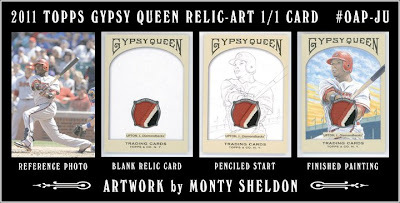 This morning Monty Sheldon left a comment on yesterday’s posting explaining the process on how these cards were created. 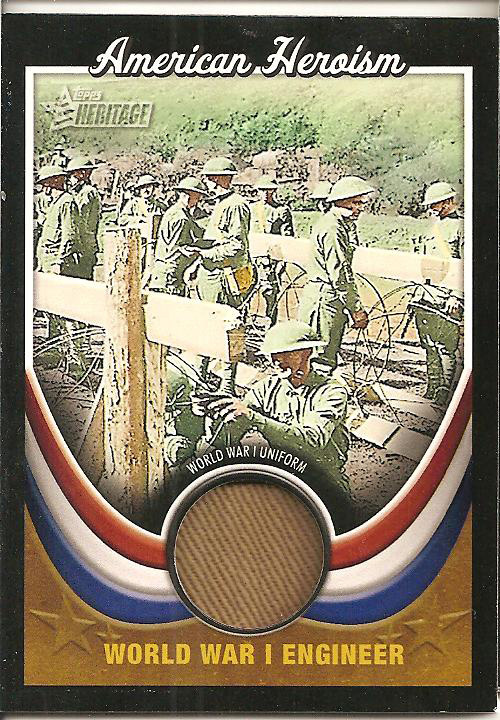 I still would have loved to see these cards as a complete hand painted card sans relic but this is definitely something original by Topps and they did use amazing patches so I can understand the collectability with them. Sheldon posted the 4-panel process with each card from origination to completion and it is quite cool to see each step. One cool thing that you will notice is that he changed some of the backgrounds from the original images, this worked out well because they highlight the player so much better plus it gives each card a more “historical” feel. Here are some of my favorites from the set starting with my Mariners and ending with the hometown Diamondbacks (including an old school D-Backs Schilling). 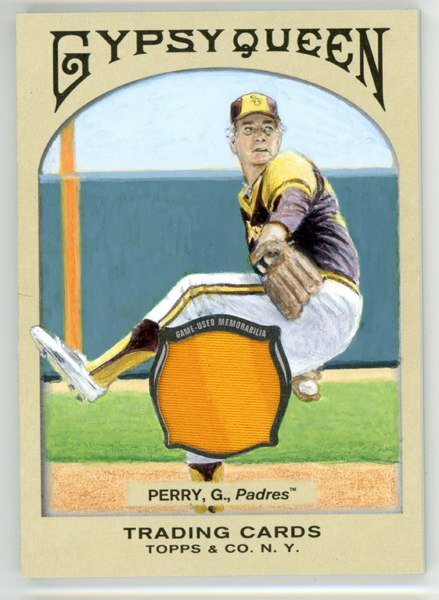 I don't know why but the Gaylord Perry calls to me, probably because of the hideous 1970s-80s Padres uniforms. Click each image to see a larger version. 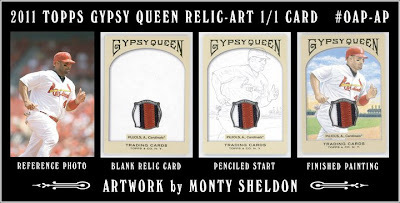 Last Saturday artist Monty Sheldon, a well-known and very talented artist, posted images of some 1/1 sketch cards that he completed for the upcoming Topps Gypsy Queen release. The detail that went in to these hand painted cards is amazing. Just look at the uniform of Ichiro, the folds of the fabric and shading is so in depth it looks almost real. The effort Sheldon took to detail every player individually takes real talent. Ozzie’s facial hair is a perfect example of the time he took to paint these cards. 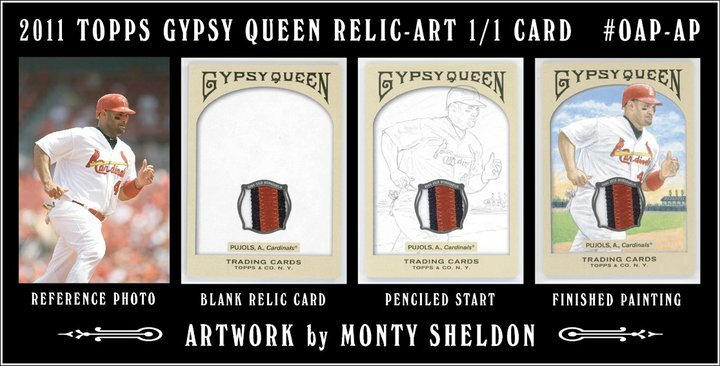 With that being said I have to say that the relics added are like a blemish to these cards, almost a slap to the face of Monty Sheldon. They weaken the design and flow of the card and obscure the time and effort that the artist put in to the card. 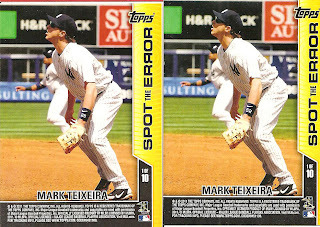 Why would Topps do this? 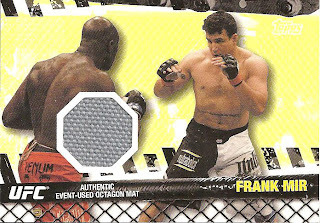 I realize that Topps went with some amazing patches in most of the cards but in my opinion ruined a great card. I have to ask, why would Topps use beautiful multi-colored patches in 21 of the cards but make the Red Sox (and Victor Martinez) fans endure plain jersey swatches? (I included Victor Martinez with the Sox because his swatch is from when he was with the Red Sox). Even Gaylord Perry’s plain swatch is multi-colored yellow. 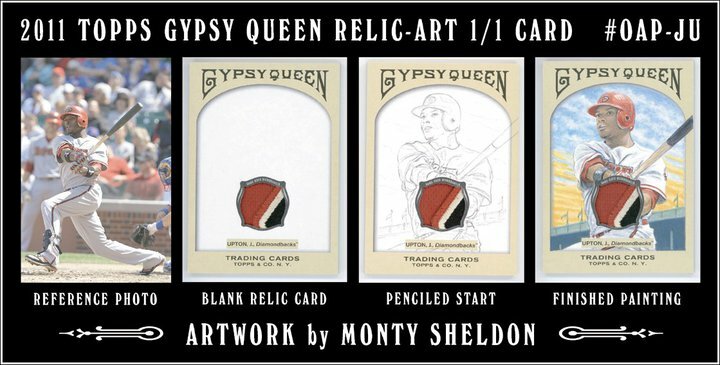 I am truly saddened that Topps would do this to an amazing 1/1 sketch card. If this was the original plan why would they not have Sheldon paint 2 of each card with one being the sketch card and the other being the sketch relic card? As an artist myself I would be more content to have a complete sketch card instead of one containing a patch. I am a history buff; I have been my entire life. I think this is why vintage cards appeal to me; it is not necessarily just the athletes on the card as much as it is the history connected with the athlete or even the card itself. There are certain periods in time that specifically appeal to me including the American Revolution and World War I. 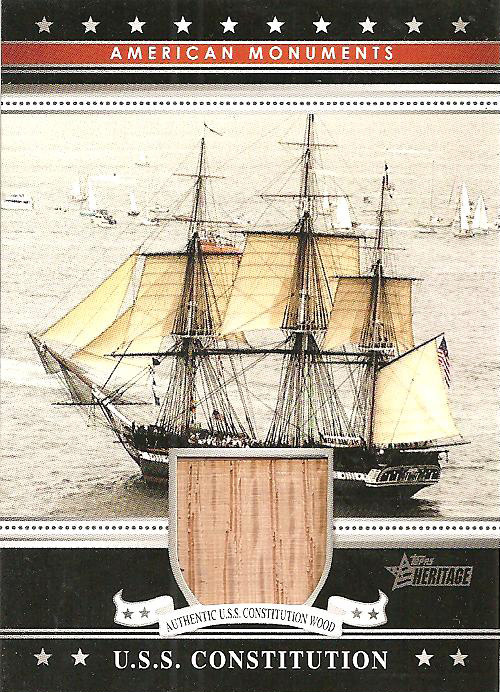 Last year I came across the 2009 Topps American Monuments USS Constitution relic that contained a piece of wood from this iconic ship, which is actually the oldest commissioned warship in the world, and ended up picking up one for a song and a dance. Because I never really paid much attention to the Heritage releases I never knew what was included in the sets and while I know that many people do not like non-baseball related cards in a baseball release I could not have been happier. With the 2011 Topps Heritage release just recently hitting shelves I wanted to take a look at what other historical relics have made their way through the Heritage releases. 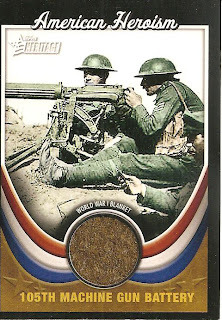 I was floored when I came across the WWI and WWII related relics from the 2009 Heritage set. 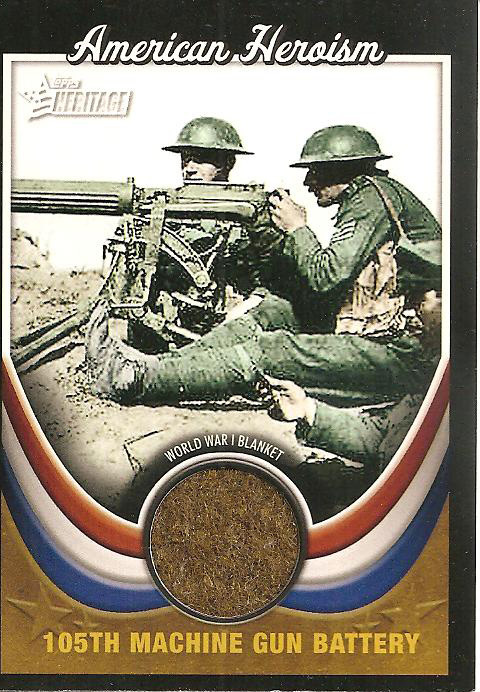 Most of the cards I have come across are from WWII and while interesting I am drawn to the WWI cards. As best as I can tell there are 4 cards connected to WWI: An Engineer uniform, a blanket from the 105th Machine Gun Battery, a WWI soldier’s uniform and a Signal Flag (I have seen red and white versions). I grabbed the two that I was able to find most readily, the Engineer uniform and the blanket from the 105th Machine Gunners. I just got the cards in the mail today and I am in heaven. The Engineer uniform actually is tan and has a velvety feel; I am quite surprised because I had always thought that uniforms of the era were made of wool. This may be a specific uniform for the engineers though and that could be the difference. Because this is a generic piece I have no idea of who wore it or where it was worn. I am still hoping to find the WWI Soldier’s uniform relic because I have only seen 1 on eBay so far and it is part of a 3 card lot selling for $45 plus shipping. 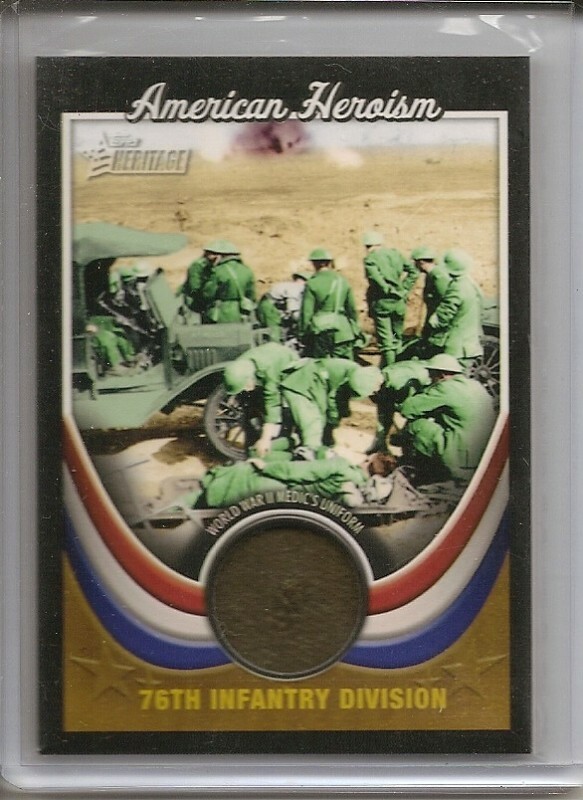 There is one other card that is of interest to me (along with the Signal Flag), the 76th Infantry Division Medic Uniform. 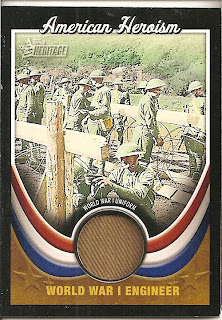 The card is marked as a WWII Medic Uniform (AH-WWII2) but the image on the front of the card is clearly soldiers from the First World War. They are wearing Brodie Helmets and appear to be wearing Trench Boots and canvas leggings plus the ambulance is clearly a WWI vehicle and the satchels that three of the soldiers are wearing over their shoulders are gas mask bags. The 76th Infantry was deployed to France during WWI too. 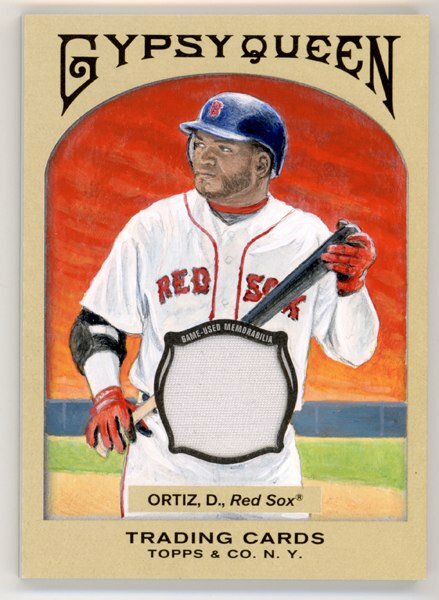 This may be a generic image that was used in error by Topps designers but I still wouldn’t mind getting one of these at a reasonable price just in case.